Images are the #1 cause of slow sites. Speeding them up is not all about optimizing the images in your content either. I’ll show you how to see ALL of the images loading on each of your posts. And, I’ll show you ways to rethink your images so you can reduce how many you load, plus how long they take. Run that test and count up all the images. Are you shocked to see just how many images are being loaded? Are ANY of those images way bigger than they appear in the post? If you’re uploading images bigger than what can be displayed on your site, then that’s the first way you can radically reduce the load time. In the WebPage Test, did you see bold text above the image, indicating that the file size could be further optimized? No matter what optimizing technique you are using, it’s worth checking to see if you can make it better. It is, by far, the best tutorial I’ve ever seen on the topic. And be sure to get the optin at the bottom for even more tutorials on GIMP, Compressor.io and more. If you are using a widget or script from Pinterest or Instagram or other image-centric social media, you were probably shocked to see them bring in so many images – and such big ones!!! Those widgets/scripts can also generate 55 additional requests to your page load too!! That’s bloat you can’t afford if you want a fast site. See this post on how the Pinterest Widget (or script) overloads your site with requests. Fortunately, there’s an easy way to have your cake and eat it too. See this post for widget alternatives that won’t slow down your site. Not all of those big tower images in your post are Pinterest pin worthy. In fact, I bet neither you nor anybody else ever pins them, right? So, why are you slowing your site down with them? I bet you can find all kinds of creative ways to keep the images AND, have more interesting layouts for your visitors. Do your images actually tell a story? Scroll through your post and just look at the images. Don’t read the text. Do your images take me on the journey of your post? Or do you just keep showing 15 different angles on the same, already baked pie? That’s not in the least bit interesting to anyone. Yes, but not the same one over and over and over!!!!!!!!!!!!!!!!! They just scroll past all of that as fast as they can to get to the recipe. And if you’re using those huge images to break up thin content, you’re creating a whole other SEO problem for yourself. For images like your logo and in your sidebar, you can easily swap those out for images that are the proper display size, and the file size is as optimized as it can be. And while you’re at it, rename the file for better SEO too. But, you need to be careful about swapping out the images in your content. For the images that are non-Pinterest pin worthy, there is no problem with just swapping them out for a better image, or deleting them all together. Be sure to delete them from your Media Library too!! You’re paying for hosting disk space, and they make your backup files huge too. So get rid of them if you don’t display them on your site anywhere. For images that have been pinned or shared on other social media, you need to retain the file name and the upload path. So, you can’t just swap them out for a new image. When you upload an image, it goes into a folder for the year and then a sub-folder for the month. All of that info becomes part of the link to the image. So, if you just delete that image and then upload another one, even if it has the same file name, it will have a new path based on the date you uploaded. This is where bulk image optimization services comes in handy. They download the image files by month, run them through an optimization process, and then put them back right where they were. You retain not only the file name, but the link path. So, no broken pins or links on other social media. And it’s cheaper than you could manually do it too, like $0.04 per 100 images. Plus, if you have old posts that you no longer promote, you can elect to only have as many years’ worth of images optimized as you like. Contact me for more on this service. This is one of the worst mistakes you can make!!!!!! For one, most of them don’t even work. And I have the performance data to prove it!!!! Second, too many of them keep a backup copy of your original images. Keep in mind that WordPress already makes multiple sizes of every image you upload. It’s not going to try to squish a 1024×1024 image down to something that can display on a phone. It’s going to display one of the smaller sizes it auto generated so the image won’t be fuzzy. So, now you’re carrying double or even quadruple the number of images stored on your hosting account. Not only is that wasting the disk space you’re renting from your host, it makes your backup files huge!!! To avoid that, some of the compression services store your images on their servers. Now you’re having to deliver all of your site images from an outside source and you have no way to cache them. That can mean slower load times (even if they are using a CDN), and getting popped on speed testers for too many round trips and too many domains. You’re far better off optimizing images prior to upload than using ANY squish service. 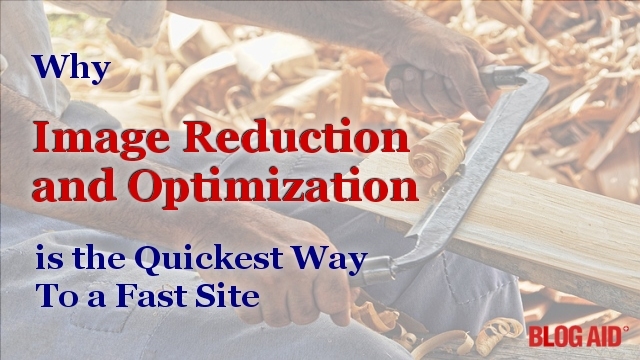 Reducing and optimizing all of the images on your site is THE best speed investment you can make for faster page loads. In fact, there is no speed tweak that can fully compensate for a site overloaded with images. Need More Site Speed Help? Everything affecting your site load speed is checked. You’ll get a 20-30 page report and a 2 hour non-geek-speak chat to go over it. You’ll clearly see ALL of the elements slowing down your page load. And you’ll be able to make informed decisions about speeding it up. Any thoughts about @2x retina images that need to be at least twice the size to look good on HD screens? Retina images are the wrench in the whole speed thing. I get why folks want to do them, but honestly don’t see most bloggers opting for that, especially the ones that have high mobile viewership. I’ve asked all of my webmaster/designer peeps too, and none of them are doing retina images, and none of their clients are asking for it. And then Google wants all of us to switch to .SVG compression, which I don’t see many folks doing yet either. Definitely something that will continue to evolve as we go. I wish I had more clear cut answers about it for us. I try to offer images that are double the size, but then heavily compress them…I never worried until I saw how horrible blurry logos and images look on a retina screen! The heavy compression is the real trick to making that work!! And really comes down to the technique that you use for that. I see so many site owners complain that they don’t have time to add another compression step to their process. And that usually takes all of 1 minute or less to do. But, finding the flow that works best for your image types is the real time consuming thing, and most folks just don’t want to make the time to do it. I believe that’s why these image compression plugin things are getting so popular. Folks will pay for that later, though!! I hear you…it’s just that extra step that takes that extra bit of time. Btw…I find this online tool excellent – free and very efective: https://tinypng.com – am not associated with them – just a fan! I like that one and Compressor.io too. This post helped me slim down my website. Since getting in “compression” gear, I found I like the site: https://compresspng.com/. What makes it useful is it adds the letters “min” to your file name when you download your compressed files. I tried TinyPNG.com but had to edit the file name as I couldn’t keep the before and after images straight. You can load up to 20 images in one batch and download the results as a zip file. Or if just doing a couple, I just download individually to save the unzip step. Over the last month or so, I went through all my core pages and replaced each image with its compressed version. (I was shocked how many large files I had uploaded early in my posting days; occasionally the large upload was just a mistake.) Then I went through my most recent posts and my “scheduled posts”. So I think I’ve made a good start to trimming excess space hogs. It’s one of those “housekeeping” chores we need to do from time to time. Have to be careful with changing images, especially on posts. If you have shared those post links anywhere, all of the images will break. When you upload a new image, it changes the path to it. This is why you want to do a new technique going forward, and get bulk image optimization services for older ones, as it preserves those links.